Painleave is a free online medical history tracker to record doctor visits, medicines, and chronic pains. 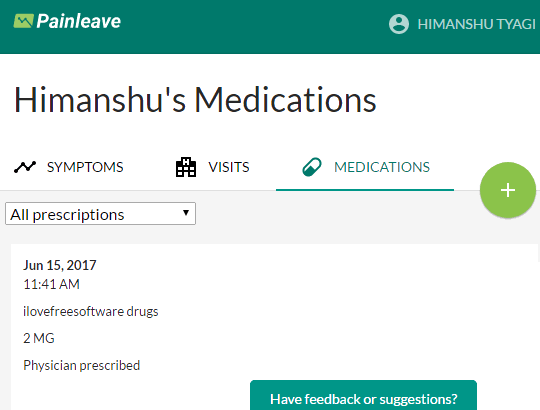 This website can be used to keep track of your medicinal data starting from symptoms to doctor visits and most importantly the prescriptions. The pro version can also let you manage doctors i.e. add and remove doctors and specify prescription quantity. I really liked the unique idea of this website as it will help you to see all of your important medical-related data at one place. It would have been a lot better if it allowed importing data to ease up the work as for now, you have to manually enter the data and save it. Also, there is no option to export the saved data. If these features are added then this website will become even more useful to manage all data related to medicinal courses and doctor visits. If you forget to take your pills regularly, you should check out these pill reminder websites. If you prefer apps instead then you can also take a look at these pill reminder Android and iPhone apps. Visit the link provided at the end of this review to go to homepage of this website. Then create a free account on Painleave. After that, you will see its main interface, as shown in the main screenshot above. 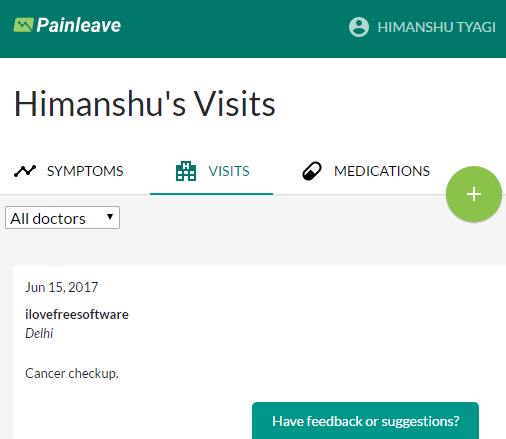 Now, you can add your medicinal details like symptoms, doctor visits, etc. Click on the big “+” button and then select an option to add symptoms, doctor visits, medication details, etc. 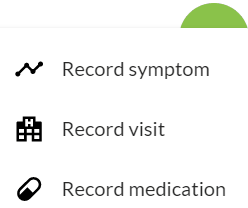 Let’s say you want to add the medication details, then you have to select the “Record medication” option. After that, you will see a new page in which you have to enter the medication details like prescription, date, time, and quantity. 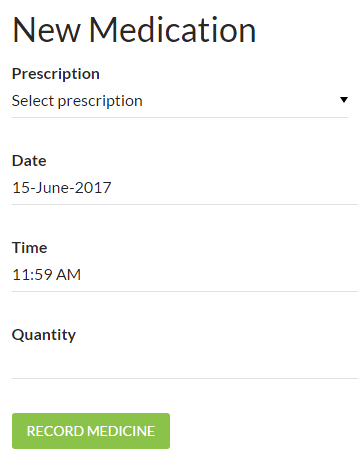 Also, note that you can create a new prescription from the “Prescription” field of the form. Click on the small down arrow button and select the “Add prescription” option. You will then see a new page to specify the prescription details like name of the medication, its description, dosage, etc. However, in its free plan, you won’t be able to specify the current quantity of the prescription and the quantity prescribed. After you have added all the medication details, click on the”RECORD MEDICINE” button. This will save the medication details and you will be able to see the newly added entry from the “MEDICATIONS” section of the website. In the same manner, you can add the “VISITS” and “SYMPTOMS” details. To add a doctor visit detail, you have to specify the date, doctor name, notes, and location and to add symptoms, you have to specify its name, description, date, time, and intensity level from 0 to 10, where a higher number represents higher intensity. After you have added you medicinal data, you can easily view from the 3 sections of the website namely “SYMPTOMS”, “VISITS”, and “MEDICATIONS”. Switch between these sections to see the added data. Painleave is a free online medical history tracker to save details of doctor appointments, medical prescriptions, etc. I think the website implements a great concept but surely misses some extra useful options like import and export of data. Also, there is no option to upload the image of prescriptions or any other reports. If these features are made available in the future update, then it will surely add to its value. For now, I will recommend it only if you just want to save your medicinal data online and in a well-organized manner.